Through a series of connections, I was offered an exclusive opportunity to purchase some of the rarest of TMNT toys. Larges bins were exhumed from the back of a New Jersey toy shop in my honor. This lost loot of treasure wasn't available to the public, making me feel like a celebrity. We carefully emptied the contents onto the floor, creating a pile of TMNT rarities that made my sewer-dwelling heart flutter with enthusiasm. Like Gollum searching for the ring, I got on my hands & knees searching for my precious. I sifted through dozens of figures, wandering though this living dream. I had never seen some of these toys in real life! They were perfect by my standards - opened from their packaging, included all their accessories & were in beautiful condition. I combed through them, analyzing them in awe, like a jeweler inspecting a flawless diamond. Most of the fun came from just seeing these extremely uncommon TMNT toys in person. But of course, I had to buy something. Avoiding bankruptcy, I managed to leave by only spending a little over $200. Yes, I spent over $200 on old toys. Take a peek at the haul that still has me in disbelief. Searching through the unreal collection, I discovered one of my holy grails almost immediately. As a kid, I found the TMNT Adventurer line mediocre. But once I got older and began traveling the world, the figures took on a whole new meaning. They were less about fighting the Foot Clan & more about embracing the spirit of global adventure - a credo of The Sewer Den. 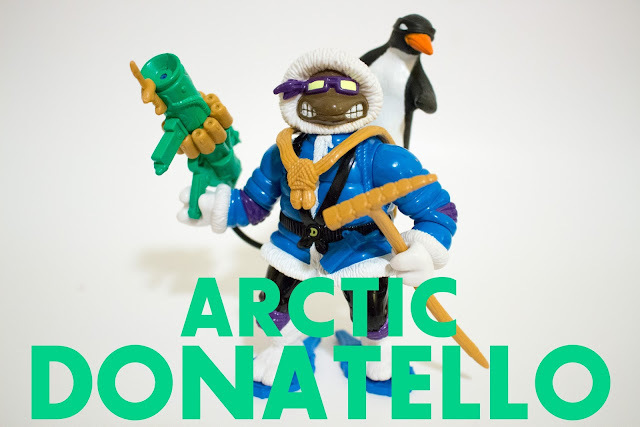 Arctic Donatello was an instant must-have. He was the first figure placed into my "purchase pile." With his bundled up, snowy attire, Arctic Donatello looked so cold! But, I was burning with excitement. My hands were sweaty and my body temperature was rising with every new figure I was uncovering. The irony was not lost on me! What made finding this figure especially tough in the past were his accessories. There's a lot of them! And they're way too cool to dismiss. 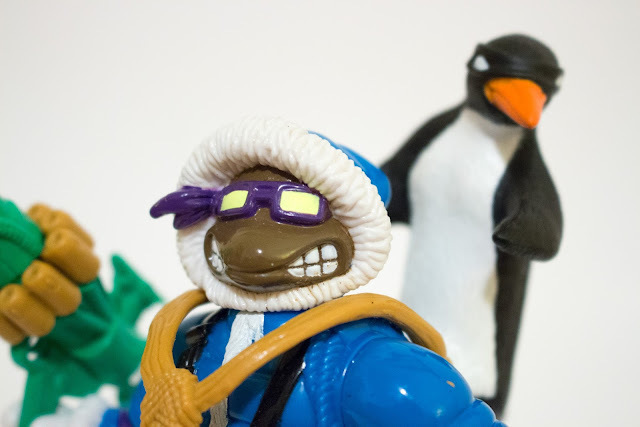 Who doesn't want a snowshoe-wearing, penguin-packing figure in their collection? 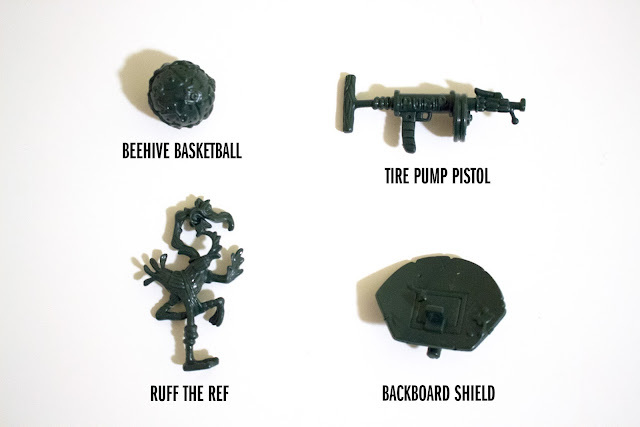 And that's what made this lost assortment of TMNT toys special - they had all of their accessories. 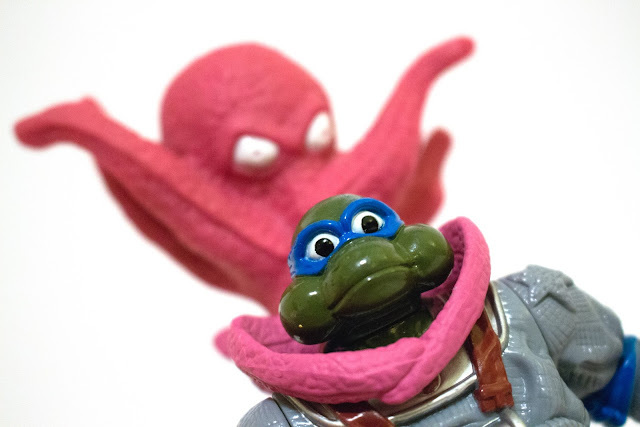 For figures like Arctic Donatello, these wacky accessories are a crucial component to their greatness. With Arctic Donatello in my purchase pile, and Safari Michelangelo already in my collection since childhood, I was only one figure away from having the complete Adventurers set (yes, they only released 3 of the 4 Turtles in this line). Luckily, I didn't have to dream about this idea for too long. It only took a few more seconds until I discovered Deep Sea Diver Leonardo in the mountain of toys. I couldn't help but laugh. Years of searching for these Adventurers figures had left me empty-handed, yet I found both of them in the span of thirty seconds. Deep Sea Diver Leonardo symbolizes where the TMNT legacy stood in 1995. The franchise had reached insubstantial levels of success, with the property slapped on every piece of merchandise that hit store shelves. There were already so many action figures and concepts, new releases were probably running thin. How could they keep the TMNT popularity burning bright? Add weirder, wackier logs to the fire! With an octopus strapped to his back (freakin' amazing! 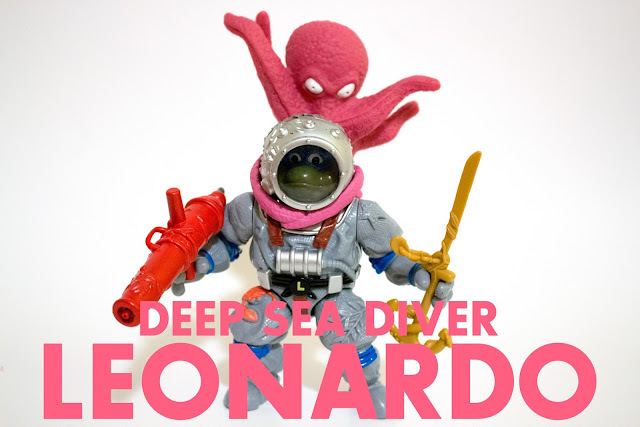 ), Deep Sea Diver Leonardo is a scorcher. 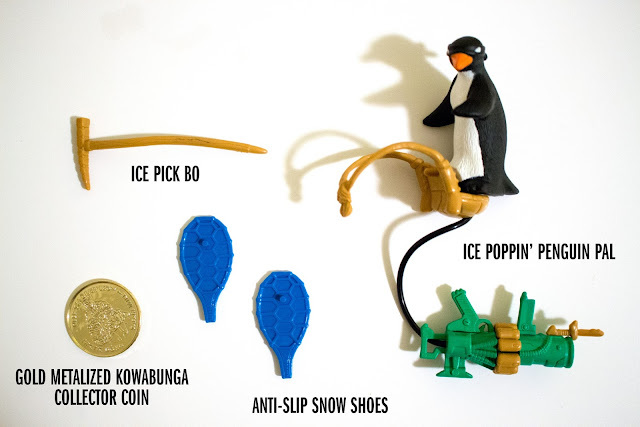 Like Arctic Donatello, this dude comes loaded with unforgettable accessories. The Gold Metalized Kowabunga Collector Coins were another last ditch effort to keep kids buying TMNT figures. Theses coins are hilarious on so many levels. First off, they're plastic. Any kid could accidentally break this "metalized" morsel in one solid play session. Even better is the spelling of "kowabunga." 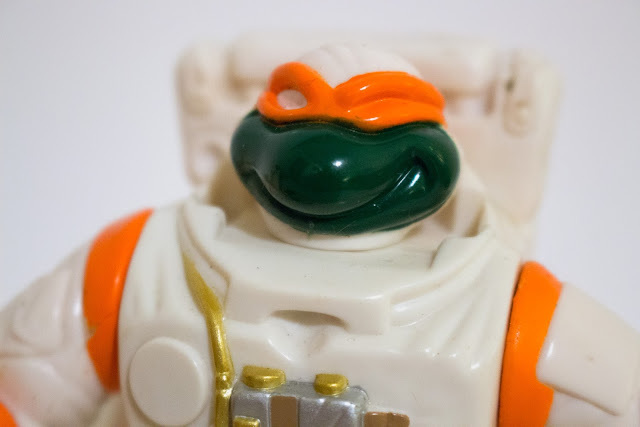 It's a fascinating peek into the brand confusion that often plagued TMNT back then. The word would be often spelled with both a C or a K. The orange bandanna-wearing Turtle often found himself in a similar situation with "Michelangelo" and "Michaelangelo." Clearly, no one was policing this sort of thing. 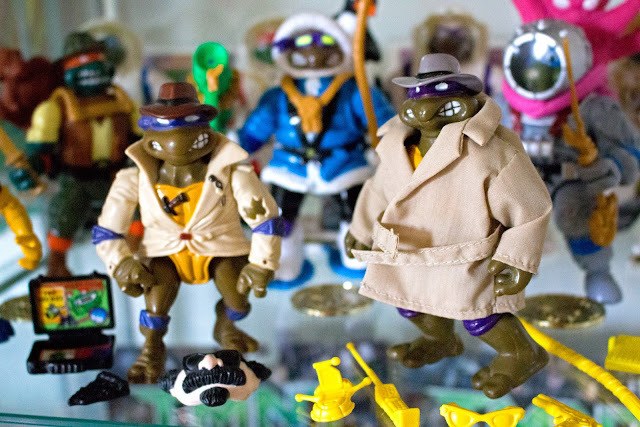 Since the Kowabunga Collector Coins were included with figures towards the end of the TMNT glory days, they are often considered rare, which also makes me laugh. 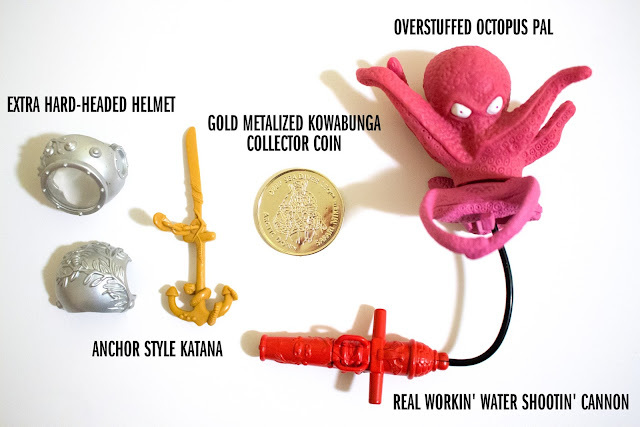 Plastic, kowabunga-spelled coins are a legitimate collector's item. More irony. After finding two Turtle figures, I shifted gears and was on the hunt for another breed of mutant. It didn't take long before I plucked a non-Turtle from the pile. Behold, the wild and weird, Halfcourt. 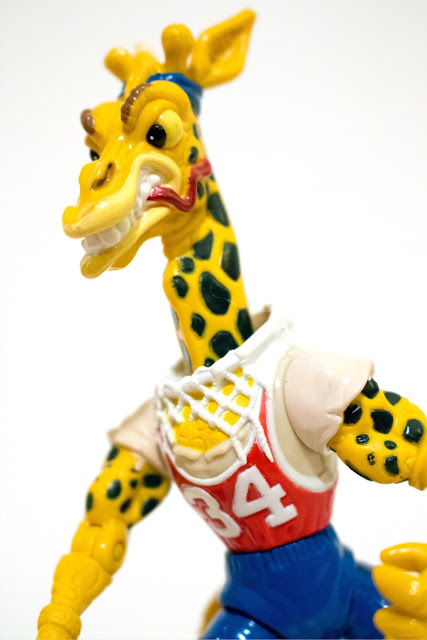 He's your typical mutant giraffe looking to shoot some hoops. Halfcourt is a figure I remember vividly. He didn't seem like a hero or a villain, just some rando that wandered into the TMNT universe. 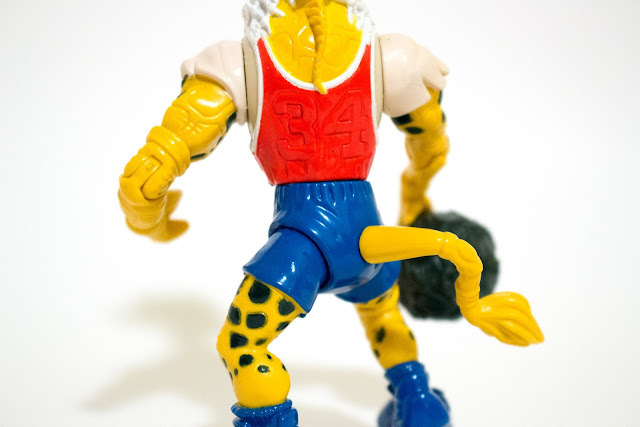 He made a better school mascot than a TMNT character. I found him so incredibly strange as a kid that it curbed the desire to own the figure. His extending neck also freaked me out! But as the years went on, my level of appreciation rose for Halfcourt. The once confusing giraffe morphed into a must-have oddity. The figure itself was crafted with care. 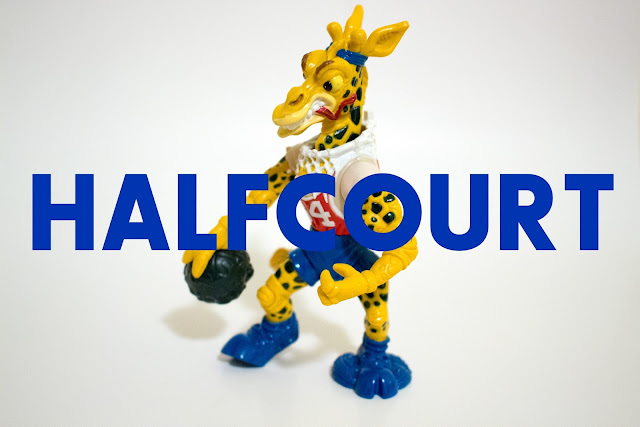 Despite being made on the cheap, Halfcourt boasts solid sculpting and satisfying paint applications. And there's tail articulation! Now, that's a slam dunk. Halfcourt's accessory lot is hit or miss. The basketball-related theme is an obvious gimmick. Nothing is particular special. The Beehive Basketball & Backboard Shield are attachable to his body, which does make fun for display purposes. Ruff The Ref is a cool companion and probably the most inventive accessory of the bunch. But, the thin, top-heavy design isn't ideal. Like many accessories of the 90s, it's almost impossible to stand up. These cosmic dudes weren't even on my radar. But after seeing them as a complete set, I was instantly hooked. Their space gear adds extra bulk, making them feel bigger than the average figure from this era. Lunar Leonardo, "The Moon Leapin' Mutant Master"
Retro Rocket Raphael, "The Propulsion Powered Pizza Pal!" 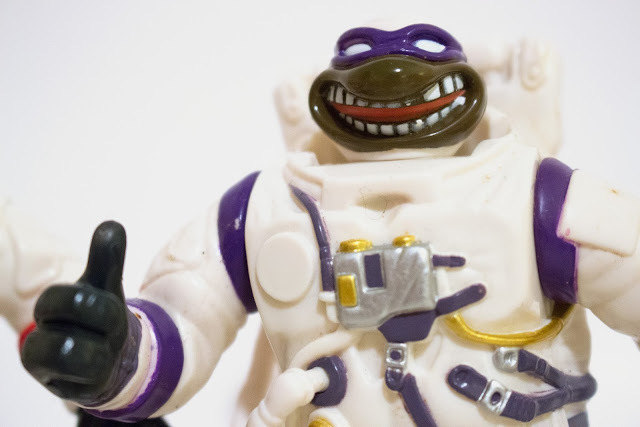 Touchdown Donatello, "The Surface Surfin' Space Dude!" Moon Landin' Michaelangelo, "The Saucy Space Explorer!" The four figures are essentially identical from the neck down. Their bulky space suits have the same exact build, with the only difference coming in form of color. Most times, this is a lazy effort and cheap move by toy manufacturers. But, I'll let it slide simply because this results in four thumbs-up-giving Turtles. Displayed as a set, this is an extremely amusing visual. Even though their bodies are pretty much carbon copies, each space-exploring Turtle has a head that's truly unique. They're out of this world awesome, featuring some of best facial expressions I've ever seen among the classic TMNT toys. I guess you have to go to the moon to get grins this kooky. In the 80s & 90s, action figures had a hard time standing on their own. Frustrated kids became accustomed to their toys toppling over by the weakest of sneezes. And in this era, it wasn't common practice for manufacturers to include a stand to display your figures. 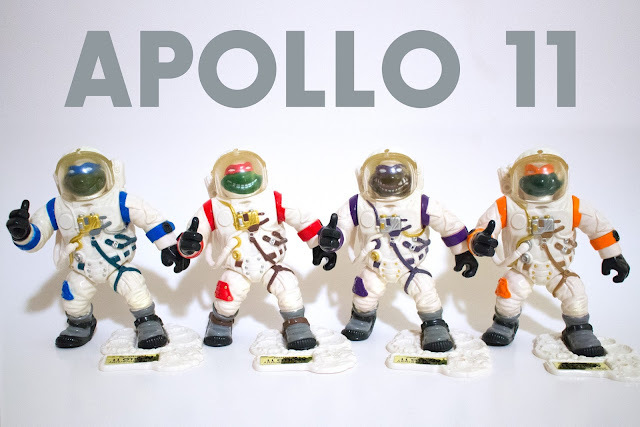 But, not with the Apollo 11 Turtles! As if another reason was needed to showcase the speciality of this set, each Turtle came packaged with their own display base. The cratered, moon-like design props the figures up perfectly. 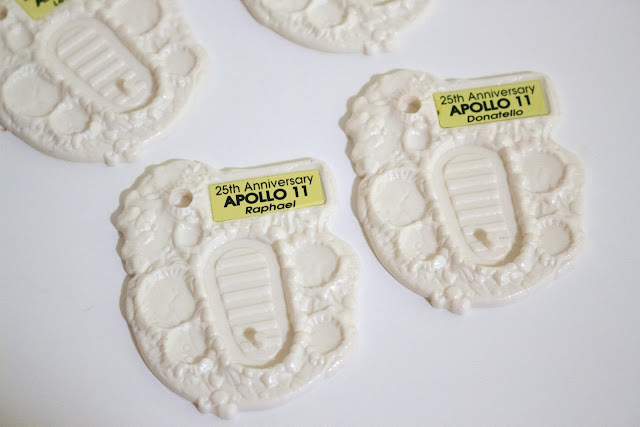 Although their plastic mold is identical, each base has a Turtle-specific sticker. Now, I can exhibit these NASA ninjas without fear of their collapse. Watch out, The Sewer Den might be mistaken for the Smithsonian's National Air and Space Museum. Another nifty accessory is the Long May She Wave American Flag. You'll notice the previous owner of this set refrained from applying any of the stickers. This has left me in a state of indecision. Stickers are always such a hot button issue with collectors. Do I or don't I apply them to my toys? I need guidance! 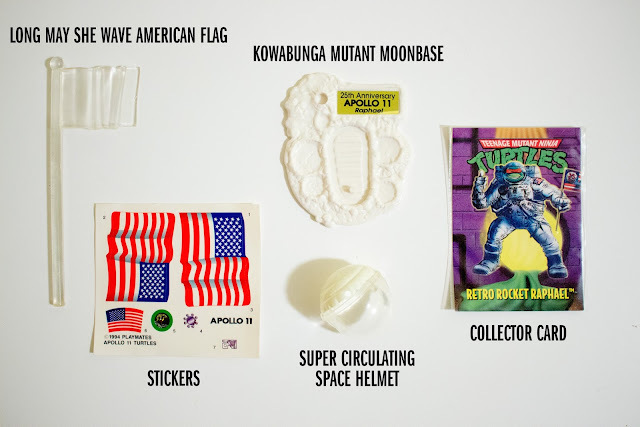 Whatever I decide, the accessories bundled with the Apollo 11 line are unbeatable. They complete the already-awesome action figures, and push them into a class of perfection. Every race has a winner and a loser. Before moving to the victor, the cream of the crop of my toy haul, let's look at who's crossing the finishing line last. 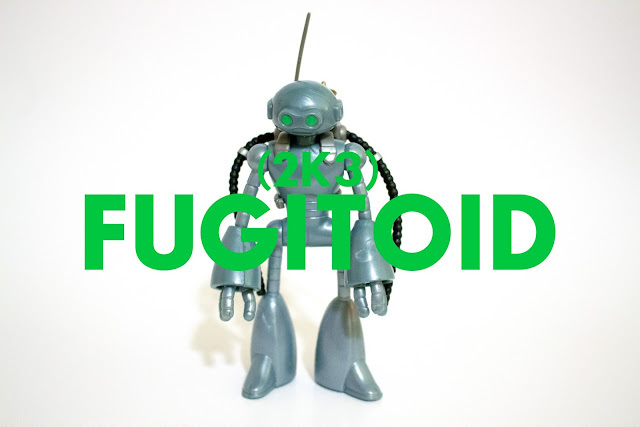 Fugitoid from the 2003 cartoon series - I consider him the dud of the group. I would normally be ecstatic to find this figure in the wild. He's been a must-have on my radar for years. But given the extraordinary circumstances, sifting through this collection of such extreme rarities, his appeal dipped. I still made the purchase anyway, mostly because he "was there." Even if he gets the last place title, he's still a figure that I'm glad to have in my collection. Fuguitoid is gentle soul. His little green smile is carefree and adorable, like a friend who's delighted to just be included in the group. He's probably the happiest-looking figure of my purchase, which is amusing consider he's a robot. His chrome blue coloring gives him a huggable quality too. He's the friend that makes you a cup of tea when you've had a rough day and listens to your boring work drama without interrupting. We all need pals like Fugitoid in real life. But as an action figure, he leaves us craving creative absurdity! 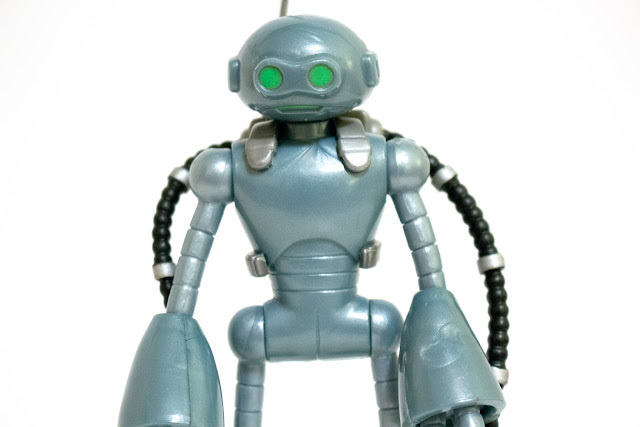 Another reason poor Fugitoid falls to the bottom of my list is his lack of accessories. A complete figure includes several more items, but I got bamboozled. 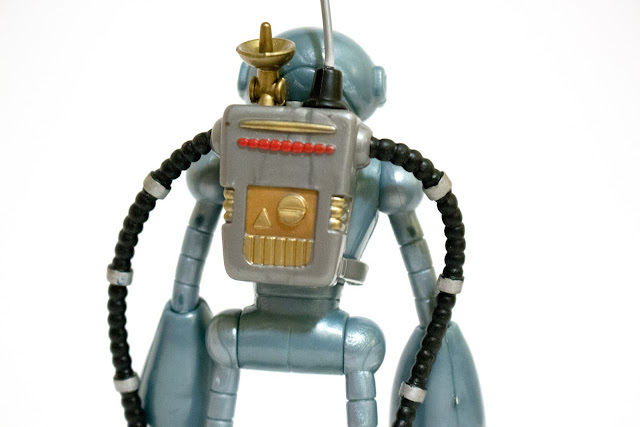 My bionic bud only came with this dandy backpack. It's a well-detailed and very cool accent piece, but I wanted all of the accessories (considering the seller priced it as complete figure). I feel a little cheated, but then again, these are just toys and I'm 32 years old. A toy. An inspiration. A legend. Undercover Donatello is my TMNT spirit animal. He symbolizes everything I love about the Heroes in a Halfshell - goofiness, gimmicks & a striking sense of fashion. 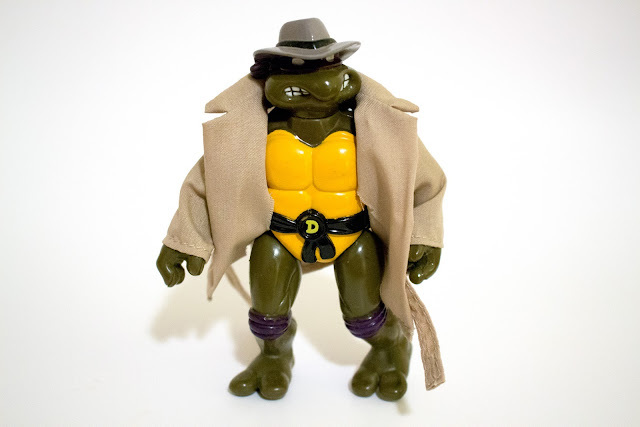 In 1990, a similar version of Undercover Donatello was released, called Don, the Undercover Turtle. This figure was the original incognito ninja. His trench coat wasn't made of cloth, but instead an irremovable plastic. The figure was so incredibly cool to me at the time. It even inspired my 7 year self to recreate the look for Halloween. The outlandish costume was a truly original concept in the early 90s. It has since been so hailed & praised over the years, becoming a legend. The silly getup I wore on that chilly October night is still my favorite. When I stumbled upon Undercover Donatello, nostalgia hit hard. One flash from beneath that cloth trench coat and his bare body transported me back in time, reliving the glory days of my imaginative Halloween costume. Too bad his action figure didn't include a Trick or Treat bag accessory. The sparse availability of Undercover Donatello bumped his price tag up quite a bit. His cost was more than I would ideally like to spend, but how could I pass up this iconic figure? Each glance mustered up more cheery memories. I realized Undercover Donatello goes beyond being "just a toy." He's historic in my TMNT makeup, the roots to my cowabunga-obsessed life. So naturally, I scooped him up for The Sewer Den. 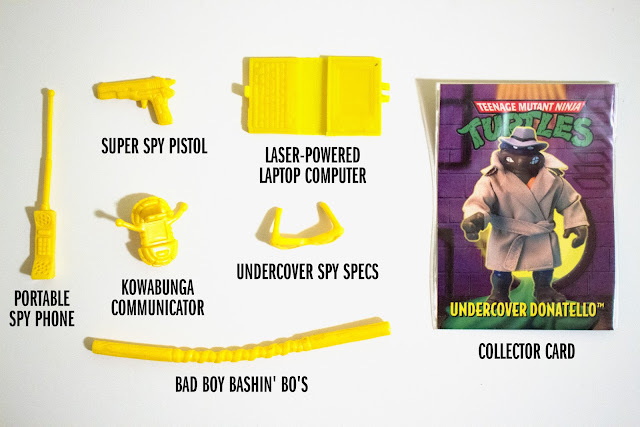 Undercover Donatello came loaded with a bevy of accessories that probably seemed much stealthier in 1994. The Portable Spy Phone takes home top honors in that category. A private eye like Undercover Donatello might lurk in the shadows, but that towering antenna is an instant attention grabber. The included Collector Card was along the same lines as Kowabunga Collector Coins, a grasping at straws attempt to keep TMNT toy collecting alive. The baseball card-like format of this series often featured impressive artwork of the respective characters. For how wonderful Undercover Donatello is as a figure, unfortunately his Collector Card is underwhelming. Instead of an illustrated design, the art is nothing but a poorly cutout photo of his figure. I would've loved to have seen this character in the fine art format. But then again, who cares? 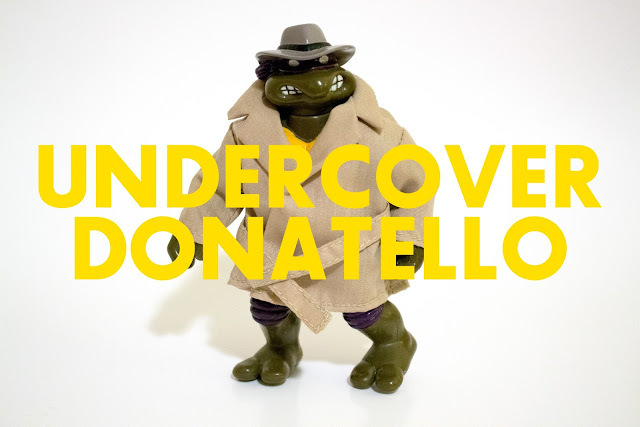 It's Undercover Donatello, my idol! I exited the store, returning into daylight and leaving my living dream behind. The experience was almost too much, my head still spinning and my mind clouded by endless images of rare TMNT toys. I shook it off, slowly adjusting to the sunlight. If it wasn't for the bag of figures dangling from my hand, I wouldn't have believed any of this happened. But, it certainly did. Yep, I spent over $200 on old toys. Judge me all you like. That number could've easily been in the thousands. I somehow restrained myself, preventing my savings account from sinking into the sewers. Fun stuff! 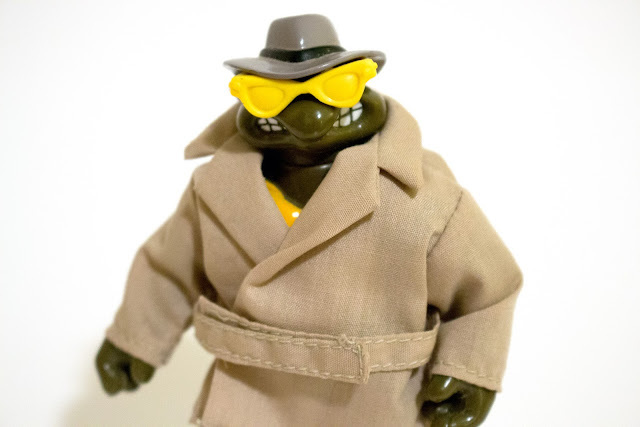 I also really love the first Undercover Don, and would love to have that later version. The fact that you dressed up as Undercover Don for Halloween is just awesome - what a great picture and memory! YESS!!!! I don't think I've ever seen ANY of these guys other than Halfcourt! And I love the Halloween photo! Oh YEah! 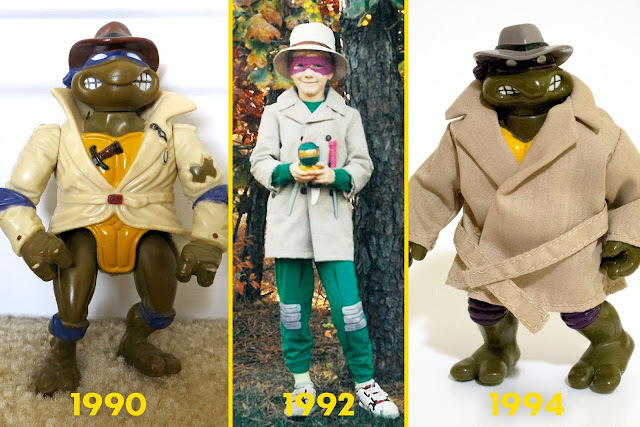 I had the undercover Donatello 1990 versión and I loved it! unfortunately it lost an arm (in a fight vs a Saint seiya toy) also i had punk Donatello, that one was my fav! I have never seen that version of Undercover Don before. He looks great. I do remember seeing Half Court hanging on the pegs. By that time, I was starting to think the Turtles were just a bit too goofy for someone my age. I also left a Scratch hanging there for the same reason. Yep, I'm an idiot..
That Undercover Don costume is awesome btw. I wish I was that creative at that age.